Sturdy, compact, and surprisingly affordable, the versatile Mini Static can handle cameras from 35mm to 4x5-Inch formats. Ideal for I.D., passport work and portraiture. 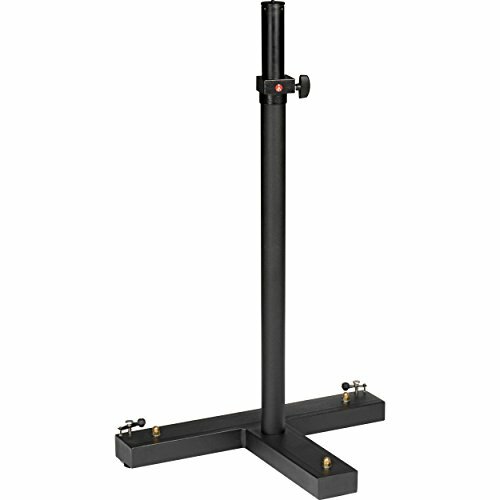 Pneumatically damped black anodized aluminum column extends from a minimum of 92cm to a height of 162cm. A 3/8-Inch male thread on column top allows direct mounting of head. Cast iron base has two pivoting wheels for easy movement and individual locks. Attachment: 3/8-Inch screw; base dimensions: W85 x D54cm - T-shape floor space occupied; color: black; height: 63.78 in. ; load capacity: 17.64 lbs. ; material: steel base and aluminum column; maximum height: 63.78 in. ; minimum height: 36.22 in. ; weight: 50.71 lbs. Based in Northern Italy at Cassola, Manfrotto designs, manufactures and markets a wide range of camera and lighting support equipment for the professional photographic, film, theater, live entertainment and video markets. The product line includes an extensive range of camera tripods and heads, lighting stands and accessories. Manfrotto products are sold by its own distribution companies, Manfrotto Distribution, in China, France, Germany, Hong Kong, Italy, Japan, the United Kingdom, and the United States, plus independent distributors in over 65 countries around the world! The unrivalled strength of the international distribution network and the team efforts between the company and the distributors is a key element in the success of the lines. The group owned distribution companies provide direct access to the market, trends and requirements which is essential in keeping the company at the forefront of development and innovation. Pivoting wheels allow for easy movement.